The Aarrow Ecoburn 4 plus multifuel stove: simple, practical and precise, this stove boasts high efficiency in combination with sleek design. 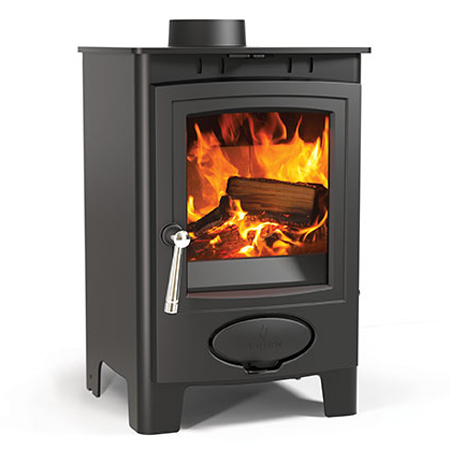 Its Flexifuel system allows greater flexibility in fuel choice making this the ideal stove for a small to medium sized room or houseboat. The Aarrow Ecoburn 4 plus stove: simple, practical and precise, this stove boasts high efficiency in combination with sleek design. Height adjusting legs come as standard with models in the Ecoburn range, great if you are placing your stove onto an uneven or riven hearth surface as you can level the stove. Just a few reasons why Aarrow are one of the best in the business, putting customer satisfaction first in every aspect of design and engineering.